VATES is an occasional (and free!) publication that aims to bring contemporary Latin poetry to the attention of an English-speaking audience. The purpose of the journal is to promote both the reading and the writing of new Latin verse in an attempt to reverse the decline of Latin poetry composition in the English-speaking world. Published electronically in pdf format, the journal is sent free of charge to any individual or organisation who wishes to see it. They in turn are encouraged to circulate it – either electronically or by printing copies – to an even wider audience. The hope is that the very existence of such a forum for the dissemination of Latin verse will encourage readers to contribute. The journal is not 'academic' in tone: it is intended for anyone with an interest in the subject. 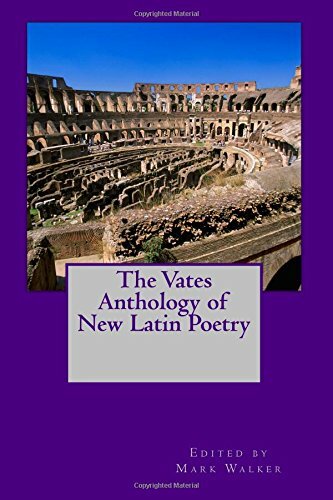 In order to make the publication as accessible as possible, featured Latin poems are accompanied by English translations and all editorial articles are in English. The journal also features articles on the history of the genre and hints and tips about writing Latin poetry. Anyone, from university professors to students, to armchair classicists. Veteran versifiers or absolute beginners. Quantitative classical verse and accentual (rhythmic) or other verse forms (e.g. song lyrics) are all considered for inclusion. Mark Walker is the translator of The Hobbit into Latin as Hobbitus Ille. He is also the author of Amida: A Novel, three books about Latin (Annus Horribilis, Annus Mirabilis and Britannica Latina) and a verse translation of Geoffrey of Monmouth's Life of Merlin. He also occasionally tries his hand at Latin poetry.